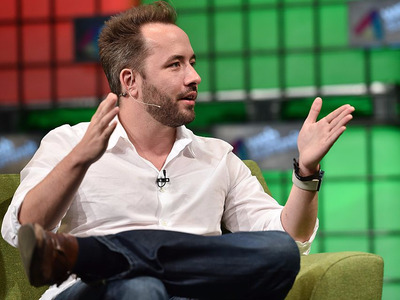 Handout/Getty ImagesDrew Houston, the cofounder and CEO of Dropbox. Dropbox surged by as much as 44% in its trading debut on Friday, marking a strong start to the most prominent tech initial public offering so far this year. At its highest trading price, the cloud-storage company was worth nearly $US12 billion, above its most recent private valuation. Dropbox is the biggest so-called unicorn since Snap to test the public market’s appetite for tech startups. Watch Dropbox trade in real time here. Dropbox surged by as much as 44% during its trading debut on Friday, recording a strong start to the most prominent tech initial public offering so far this year. The cloud-storage company had priced its IPO at $US21 a share on Thursday, above its previously expected range. The stock opened at $US29 and closed at $US28.48, up 36%, giving the company a valuation of $US11.03 billion. The IPO was another gauge of the ability of unicorns – tech startups valued at $US1 billion or more – to thrive on the public market. The biggest and most recent example of such an IPO was Snap a year ago. Its stock popped on its first trading day but has since fallen amid concerns about competition and its high valuation. Uber, the most valuable private tech company, is not expected to go public until next year. The regulatory filing Dropbox submitted for its IPO showed that the company had more than 11 million paying users. It earned $US1.11 billion in revenue last year, up 32% from the year before. Its net loss, however, was nearly halved, to $US111.7 million. It stopped bleeding cash in 2015 and maintained a positive free cash flow over the following two years. Like Snap, Dropbox warned prospective investors that it may never be profitable. Dropbox also said data and security breaches could hurt its ability to keep customers or attract new ones. The company was hacked in 2012, and more than 68 million users’ emails and passwords were leaked on the internet four years later. Dropbox has a dual-class stock structure that gives outsize power to some insiders. For example, Drew Houston, the cofounder and CEO, will control 24% of the company, while the venture-capital firm Sequoia Capital will own a 25% stake. Dropbox is trading on the Nasdaq with the ticker DBX.